I have a quick project for you. I wanted a small floral with late summer flowers. "Smitten with Sunflowers" is my moniker these days. I tried my hand at a small watercolor. I came across a print while cleaning out a closet. 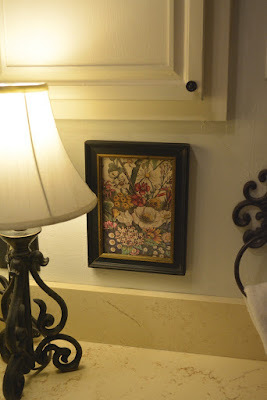 These flowers of the month were super popular prints. I'd collected quite a few of them from thrift stores. They were widely copied and ended up being seen everywhere. I was over it but I thought I could reuse a section of the floral to create a late summer print. 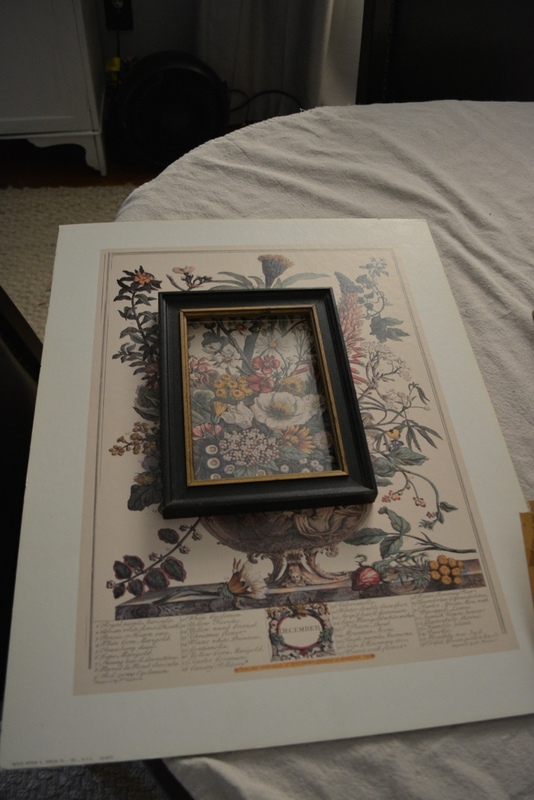 There were a couple of different frames in the garage to choose from. This little black one with the gold is cute. It is about 4 by 6. Horizontal looked the best to me. This was cardboard and needed to be cut with a razor blade knife. Working quickly prevented a "DIYer in a hot garage" sort of medical emergency. It was of utmost importance that we have a little print here by the sink in the powder room. I was too lazy to walk into the kitchen and get a hammer to pull out a nail that was stuck in the wall but not too lazy to create this new piece from an old print and risk a hot garage incident. 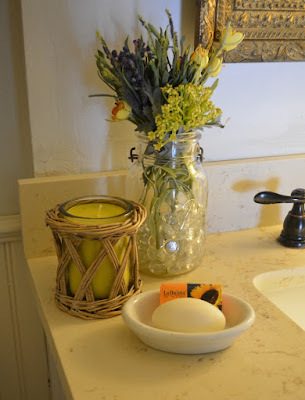 The other side of the sink got a candle, some silk flowers in a mason jar and a new bar of soap. The flowers appear to be made out of microfiber. It's my favorite type of faux. Have you ever cropped art before? You are so good. The artwork looks great and sunflowers are perfect this time of year. Did you get your bathroom counter top at Lowe's? I'm looking around for options to change ours. 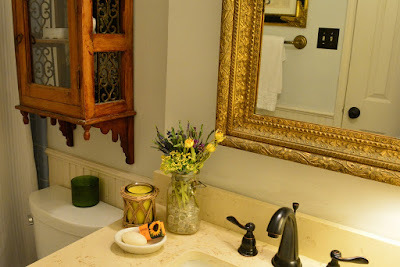 We have a yellowish faux marble in one of our bathrooms that the builder put in. Yuck!! I want to change it. We did. Maybe two and a half years ago. It was about $200.00, if I recall. Thanks, Stacey. Love it! 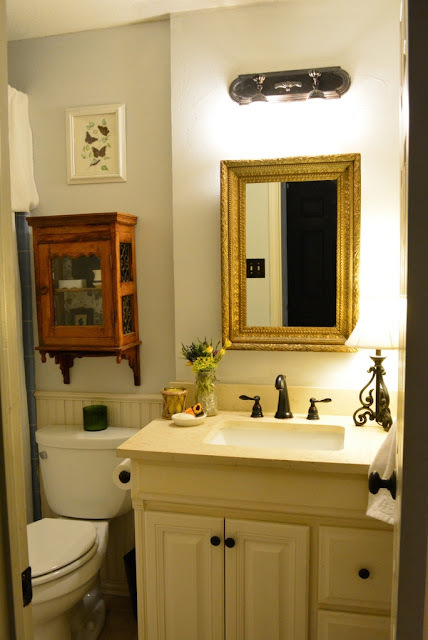 Your bathroom is very pretty. 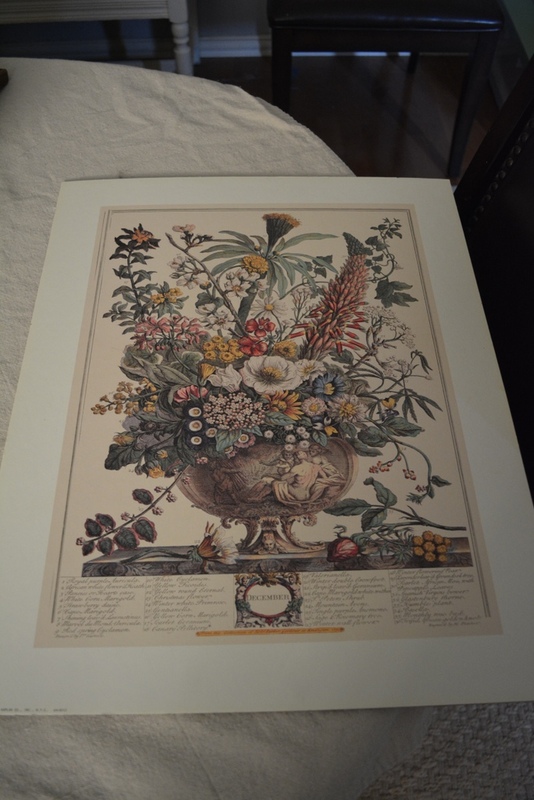 I have one of the botanical of the month prints. Bought it at a thrift store. 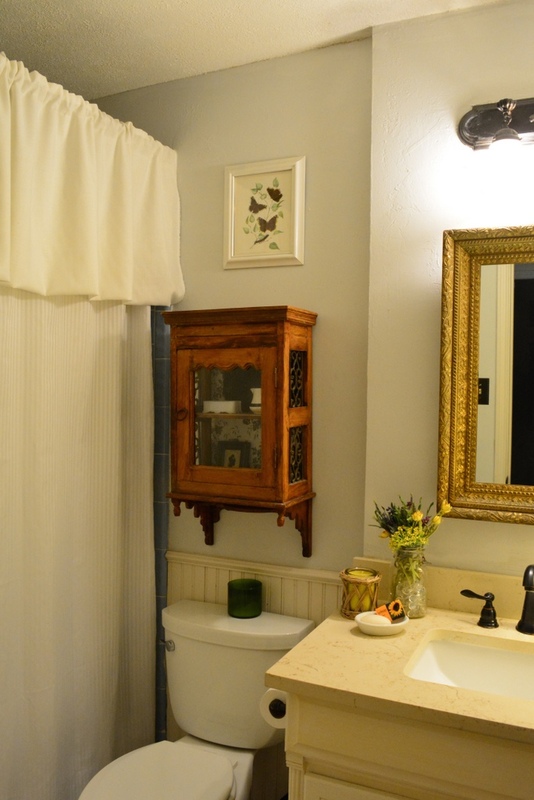 DS asked for it when he moved into his first house. A few years later, in a different house, it is not being used. I think I will ask for it back. I have always liked those prints. Love the art work Katie. That is really cool. Love seeing your pretty bathroom. Simply beautiful. 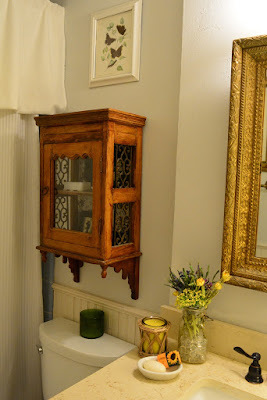 I love how you rescued that print from the closet and repurposed it so sweetly! Thanks for sharing. How pretty is that?! I've had so many gorgeous calendars over the years, but I finally got rid of them because I couldn't think what to do with them. 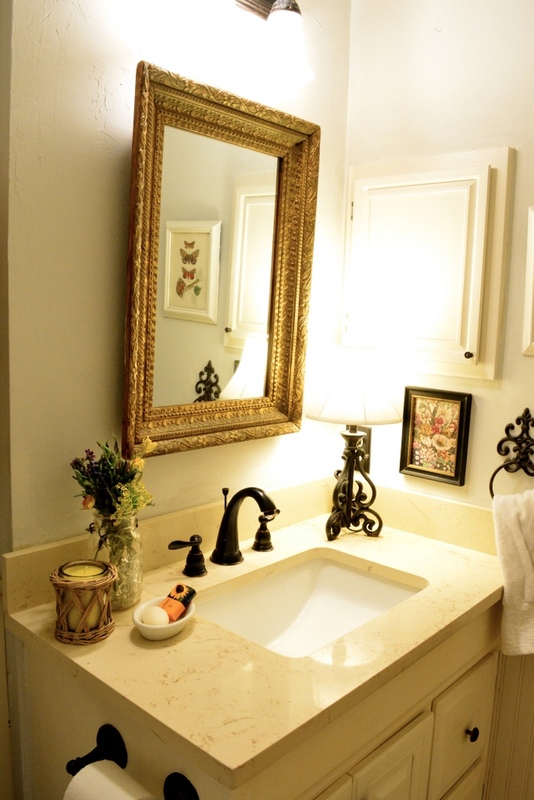 The little piece of art looks adorable in your bathroom! Your flower arrangements are pretty, too. I'm so happy with my perennials that came back this year that I hate to cut any to bring indoors. Your site is great source of inspiration for all the people searching for design ideas. 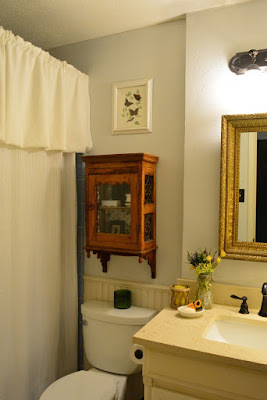 The designs are so adorable and easy to adopt.Thanks for sharing this blog with us.